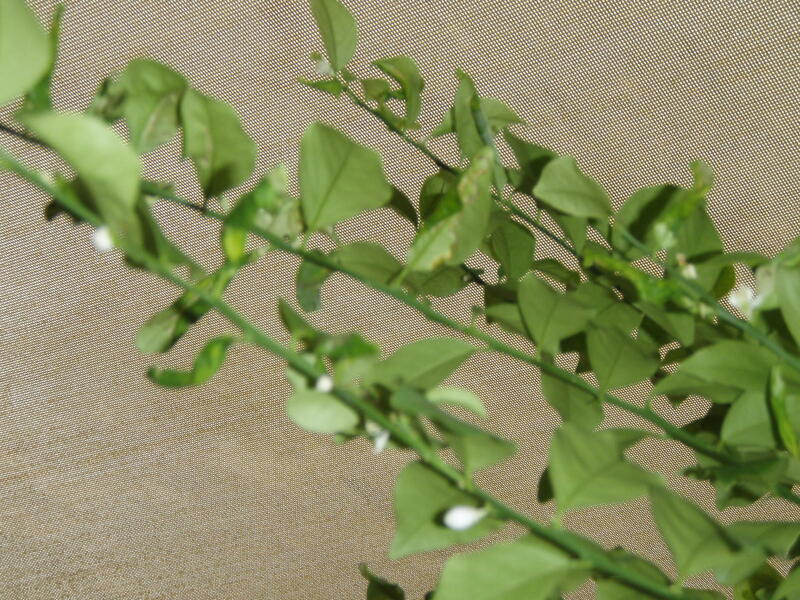 My 2 1/2 yr old finger lime has started to fruit, however the fruit falls off within weeks of developing. There are approx. 20 small fruit on the tree again and I would love one of them to develop through to full maturity. Any advice on how to stop them from falling. I'm jealous Roger. My finger lime has a few flowers and has had no fruit at all - not even ones that drop off! I hope you have some luck with yours. Wayne, thanks for the advice. We now have approx. 30 small fruit in the tree, not sure how many will survive after the heavy rain last night though. Some of the fruit are not about 5mm inlength and fairly plump. Now just ahve to pray that they grow to maturity...and that my other plant flowers and fruits! My finger lime has just gone crazy since I fed it som epsom salts...it now has 7 large fruit on it, all approx10mm, along with about 40 smaller fruit and numerous flowers. I used about 2 - 3 large tablespoons of Epsom salts and spread it evenly around the pot then watered it in. attahced are photo's of the limes on the tree. as you can from the photo's, the tree is doing very well. Additional to the salts, I have been using citrus fertiliser and ensuring that it is well watering (but not over watered). My other tree has lots of shoots and new growth but it has not flowers yet. Still hoping. Is it possible to have too many fuit on the tree? This plant has approx. 40 small fruit and 15 Large (15mms) on it, with more flowers budding. My finger lime is doing brilliantly now with lots of fruit. Thanks Roger, perhaps it was the epsom salts that did the trick. How do you know when to pick them? I have no idea when to pick the fruit. We had some unusual weather here and the fruit all dropped and I had die-back on some of the branches. I pruned the tree and it is now startign to come back with new shoots. I also replaced the potting mix with a recommended type. Unfortunately we got one bag that had too much iron in it and it killed our avacodo - still have the rust coming out in the water. Hoping that the limes start fruiting again though. I brought a sunrise lime and was wondering what they are grafted onto.? 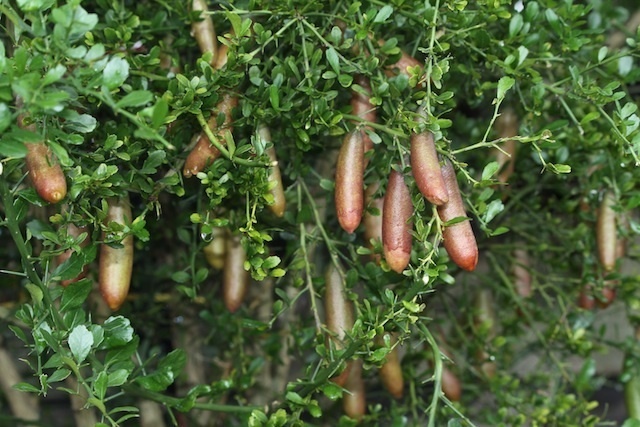 Sunrise is a hybrid of finger lime with calamondin which is a hybrid of Mandarin and a Cumquat. The root stock to use for grafting Sunrise is another citrus. One way to find out is to cut off the top and let the root stock grows. Sunrise has no thorns. Have only put on one teaspoon of Epsum Salts and watered in, it is still in the 15cm pot it arrived in as I was waiting for it to stop flowering, it is getting enough water at the moment but still most of the small(5mm) fruit turn yellow and drop off. If staring at them will keep the 5 that are still there on then they will reach maturity. Currently it is showing growth as well. My finger lime has started to fruit again. Unfortunately we had to move it out from under the shade cloth and into the garden. We had some very heavy rain which knocked off all but 4 fruit. Am hoping that they will stay connected until they reach full maturity. Here's a pic of my 4 year old Rainforest Pearl. I've already taken about half the fruit before this picture was taken. Plenty of fruit (Id guess around 300). Havent seen a seed. Sweet/sour (lime x musk sticks) kind of flavour. Hey BJ - looks good! But in all honesty - is there any advantage in growing one of these (over and above a West Indian or Tahitian lime) in a climate were water is precious do u think? Most of the "cheffing" references refer to it's good looks on a plate - but I can't afford the water to grow something just because it looks good (and yes I do have a rainforest pearl, a W.Indian and Tahitian Lime - so far the W.I/Key lime wins hands down..).. The relevance of growing these guys depends on how you use your citrus. The little balls are great in salads and strewn across a lot of foods, not just for aesthetic reasons, but because they aren't wet and wont make your food go soggy, just releasing their flavor when crushed on eating. They are also a good size to add to things if you only need 1/4 lime. I often only use 1/4 tahitian lime in drinks and things and the rest dries off in the fridge - with these guys you just use the whole thing. Also, a few of these guys are quite good eating out of hand. i tried the Ricks Red recently and it is definitely a really nice little snack on its own - I wouldn't class our 'Rainforest Pearl' fruits in this category though. Here, I dont really take much care of it and it performs about equal to my Eureka Lemon, the two of these being my best cropping citrus. It is native to this area, so I guess it might be a lot different to your climate. Also - If you are in difficult conditions for citrus the finger lime is said to have the most resistance to phytophera, so is worthwhile trying in heavier soil if you are really looking to grow a citrus. Again, probably not much of a consideration for where you are. 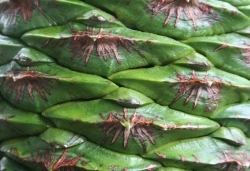 The downsides for me are the spikes (I got myself in the eye doing the compost a few times) and the pain (again the spikes) when trying to prune the vigorous mass into shape, and the haven it provides for chewing and sucking insects. Great info BJ - thanks. I actually quite like to eat a Meyer lemon out of hand sometimes (except for the heartburn it gives me!) - so the Ricks Red sounds good. I hope you and your houses and gardens are OK. Mine are. We are on a little hill, which was cut off Tuesday night to Friday afternoon (the pictures is the main road behind us last Wednesday, where it was cut off to the west and east). No power for eight days until yesterday afternoon. It could have been much worse. 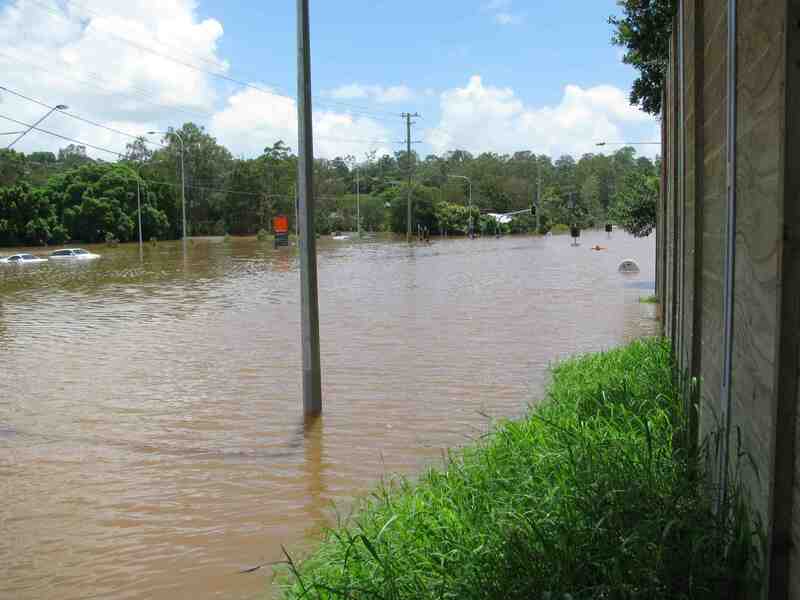 Thank goodness not more people died in Brisbane (only one I think). 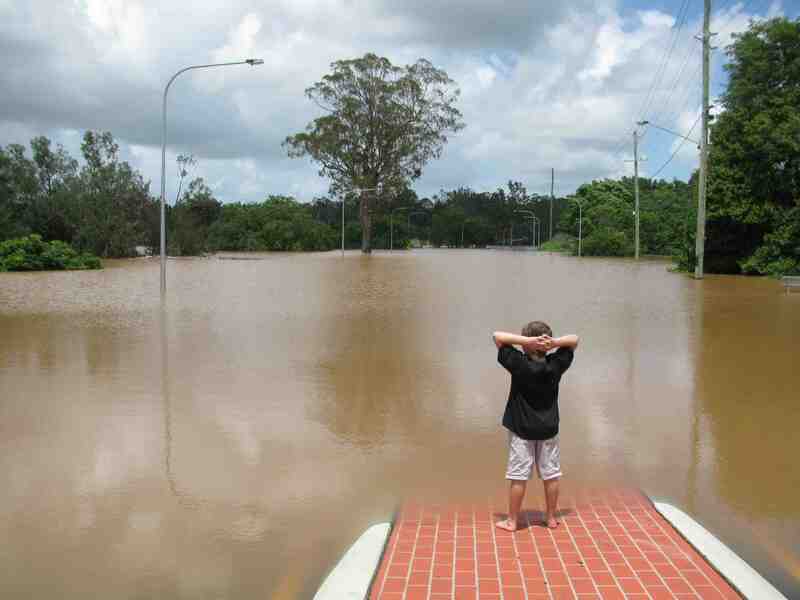 I saw a few people doing stupid things in floodwater. I have just got a ricks red finger lime- I'm glad to hear that it's yummy. Hi Diana, We're up on a hill, so we just get local flash flooding, where the water runs down the hill and pools in our yard and under our house. I will make another thread for suggestions on plants that wouldnt mind growing in a bog, or if I should just turn it into a small pond. Gee I am envious of you guys and your finger limes, I re-potted my grafted Ricks Red a month ago, all the fruit fell off (even though it was only 5mm long) and it has not flowered since where before it was never without a flower, but fruit still fell off. I gave it a good feed of Epsom salts for a while before re-potting, then when nothing seemed to happen I gave it a decent dose of Magamp when I re-potted it.. The new foliage is nice and green and the old seems to have greened up a bit but also some of the ends of limbs have lost foliage - do I prune it, I would guess it has only grown 2% sine I bought it 20 months ago. It has been a mild summer down here so have left it in a morning sun position. Thanks to your AWESOME advice of using Epsom Salt, I now have my biggest ever (one inch) finger limes growing after just less than a week of application of salt. Previously, the longest the limes ever grew to was 1/4" before falling off. My sunrise lime had new branches growing above the graft that have thorns on them, what should I do? Mature finger lime tree growing in the ground and under full sun at Fagan Park. 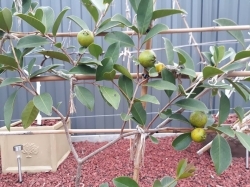 Hi i,m around an hour or so north of Perth , WA and would love to plant a finger lime if only i could find one suitable for this area , grafted only. And if so where would i be able to get one as east states don't ship to WA. 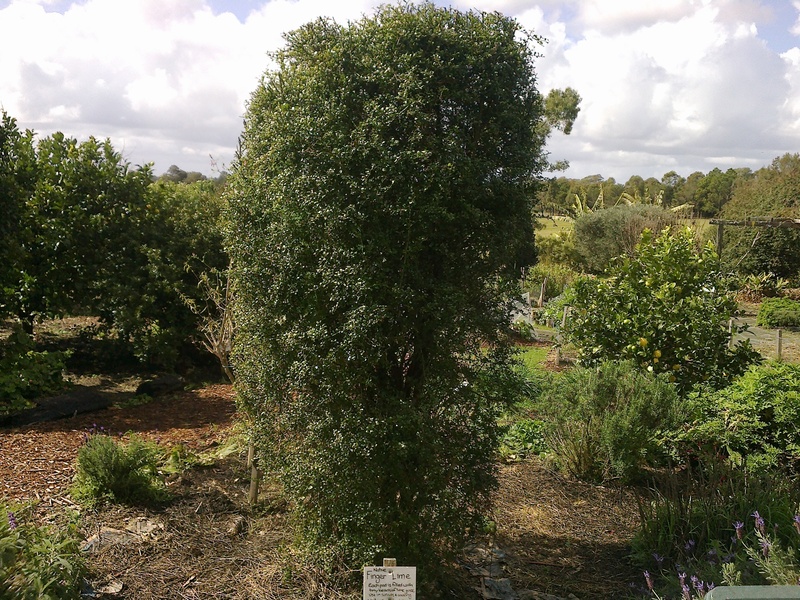 he's slightly north west of perth, but a great source of Daleys trees (that he is able to bring in through quarantine in large quantities). Seems like my RicksRed has had a new lease of life since I Epsum salted it but only seems to be flowering on old wood. 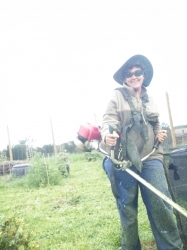 How often do you apply Epsum or citrus fertiliser. Getting cold down here in the last few days - should I move my Finger Lime and Kaffir lime into an unheated glasshouse? My tree is going on 5 years old and heavily leafed and one sided in flower. With potted citrus trees you can fertilize your plants every 4-6 weeks during the growing season but at a lesser rate compared to specimens planted in the ground. Alternate between citrus fert and dynamic lifter for better result. Apply epsom salt twice a year during spring and summer at a rate of 2 tbsp per 10 ltr of water, or if there is a perceived magnesium deficiency as evidenced by a yellowing leaf with an inverted green V shape on a leaf with a yellowish background. Certainly, you can move them in an unheated glasshouse if you are uncomfortable leaving them outside during winter, though they will survive outside in a sheltered sunny spot like a courtyard. I have seen numerous citrus trees in Melbourne situated in the front yards of home owners growing happily. Hi Fruitylicious1 thanks for that reply. Just wondering if I put my Ricks Red in the unheated glasshouse what is going to fertilise the flowers that are about to burst out or don't you need one to get fruit? Just looked up my first forum entry and guess what my finger lie is around 8 to 9 years old and am yet to eat some of the fruit. Finger limes are suppose to be self fertile. In your case if there is a lack of pollinators like bees and the like you have to hand pollinate you finger lime. The normal tool is a small sable brush or an artist brush or a cotton swab will do. 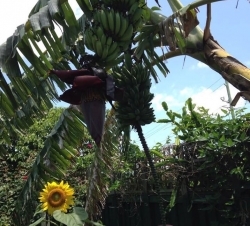 Another thing that you have to consider is avoid fertilizing when they are in flower up to when the fruits are at least 1cm long because they are known to abort flower and fruit if fed during flower and fruit production. 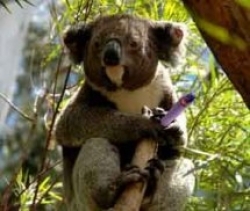 Like most Australian native plants they only need a miniscule amount Phosphorus. The ratio of the fertilizer mix is ideally 15N-4P-K11. Notice that the middle element phosphorus is only 4% compared to the other two elements. It is also prudent to fertilizer your F lime in small amount about 3x a year. Don't over feed them because it might cause them to die back. Another thing worth mentioning is the potting mix being used. 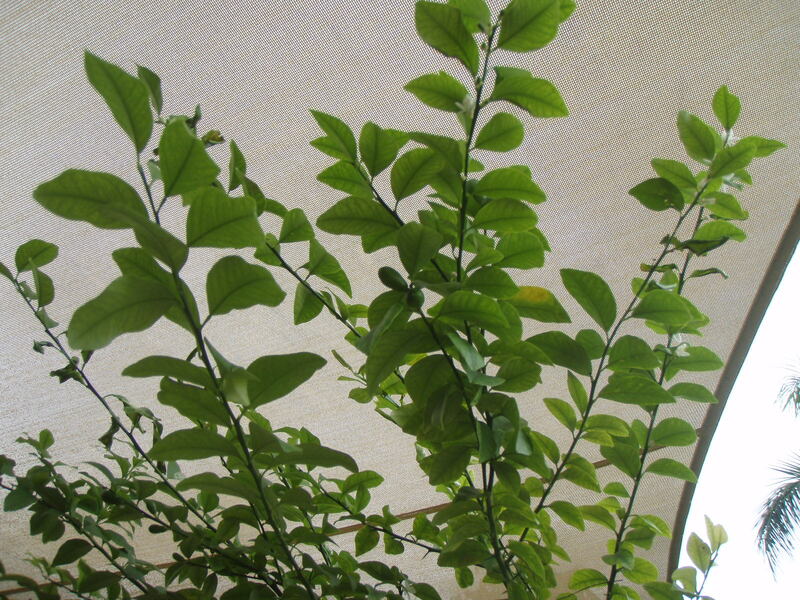 It is recommended that we should create a well draining potting mix for F limes to avoid waterlogging. A good mixture would be 40% premium potting mix, 15% perlite, 15% pine bark and 15% peat coir or peat moss plus a handful of coarse river sand. Wow, it looks like I am going to re-evaluate my idea of what is good for my lime. Thanks Fruitylicious1.